I saw the Sandwich King (Food Network) make this homemade Italian Dressing for a roasted eggplant sub. 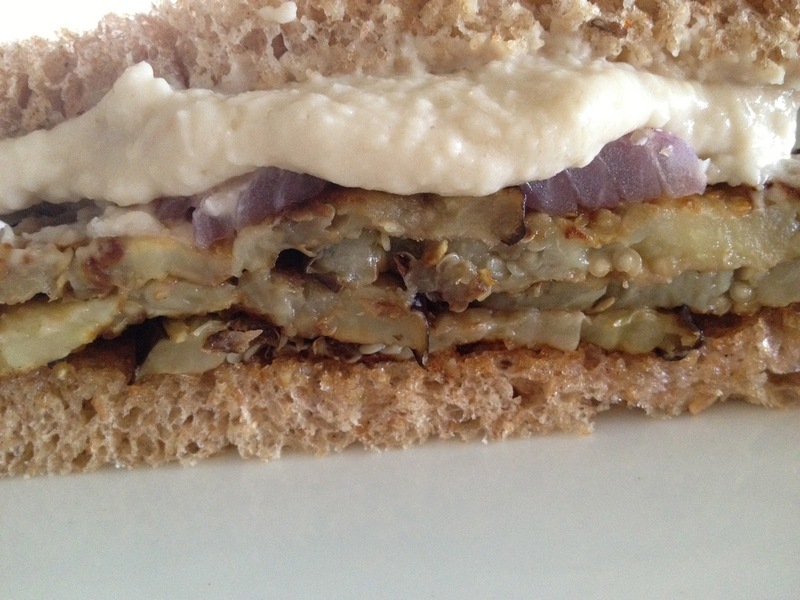 I decided to use the dressing and the eggplant and make a vegan sandwich. It came out great and I am going to send it to him and show him how sandwiches should be done. It was so good, I ate the first half before I took the picture! * I can’t always find dried cannellini beans. The canned one are just fine, just drain and rinse. Place all ingredients into the processor. Process until combined well. Dice the shallot and garlic. Place all ingredients into a jar, cover, and shake well until incorporated. Preheat the oven to 400. Slice the eggplant and red onions into rounds. Brush both sides with the dressing and roast for 30 minutes, until browned. Toast the bread and drizzle with Italian Dressing. Spread the white bean spread onto one toast and pile 4 pieces of eggplant and 1 onion round on the other. Make a sandwich and enjoy!